Everything new is actually long-forgotten. The organizers of the Floating University decided not to reinvent the wheel and started to unravel the mysteries of the Arctic using a well-tested 1980s approach. We spoke with Konstantin Zaikov, head of the Arctic Floating University project, about the unusual voyages aboard the research vessel. Konstantin, how did the idea to create the Arctic Floating University come up? The idea came up in 2012 following talks between Yelena Kudryashova, rector of the Northern (Arctic) Federal University, and Alexander Frolov, who headed the Federal Service for Hydrometeorology and Environmental Monitoring (Rosgidromet) at the time. They decided to use the floating university idea from the late 1980s under UNESCO. They were active through the mid-1990s, and then, unfortunately, it ended. The concept of floating universities has always been very interesting, so we decided to do it in the Arctic. In addition, the task of human resource training and holding deep and comprehensive marine research has always been taken very seriously. The first expedition that went to sea was held in 2012. Konstantin recalls that not everything went well during the expeditions. Coming across polar bears, races with seals, emergency evacuations and underwater collisions — a true Arctic Odyssey. The scientific expeditions turned into unexpected adventures. Changing and unpredictable weather also held surprises that sometimes made the expeditions change their routes, programs and landing points. But fortunately everything turned well. What is most interesting about the Russian Arctic? First, it is part of our country, so we must know, study and explore it. Second, it is the largest sector of the Arctic compared with the other countries. For example, Canada, the second largest Arctic country, covers a significantly smaller area than the Russian Arctic. On the other hand, the absence of up to date information and lack of monitoring data also influenced the choice. The need to train specialists, develop the monitoring network and carry out technical upgrades requires, in addition to the latest scientific data, a lot of people, such as youth interested in this research work. This is why it all turned out this way. What parameters were taken into account when choosing the Professor Molchanov research vessel? First, we needed an ice-class vessel, because there is ice in the Arctic even in the summer. Second, it had to be big enough to hold the educational process without disadvantaging the science. The comprehensive program requires a vessel suited for at least 50 passengers: a group of up to 30 students, members of the research group and maintenance staff. In addition, it had to be equipped with hydrometeorology instruments suited to establish mobile labs. The Professor Molchanov met all the requirements for the expedition. In addition, in 2012 the ship was controlled by the Northern Department for Hydrometeorology and Environmental Monitoring. It was the only ship of this type that did not require a lot of expense to be transferred to the Arctic, so the choice was obvious. According to Zaikov, last year the idea to create a more technically advanced vessel with updated navigation system came up because of the inevitable obsolescence of Russia's scientific fleet. Now this project is being discussed with the executive authorities. Young specialists from all over the world are allowed to take part in the expedition. What do the statistics say? Which country is most involved? It changes every year, but we have permanent partners, with Geneva Global being the largest. 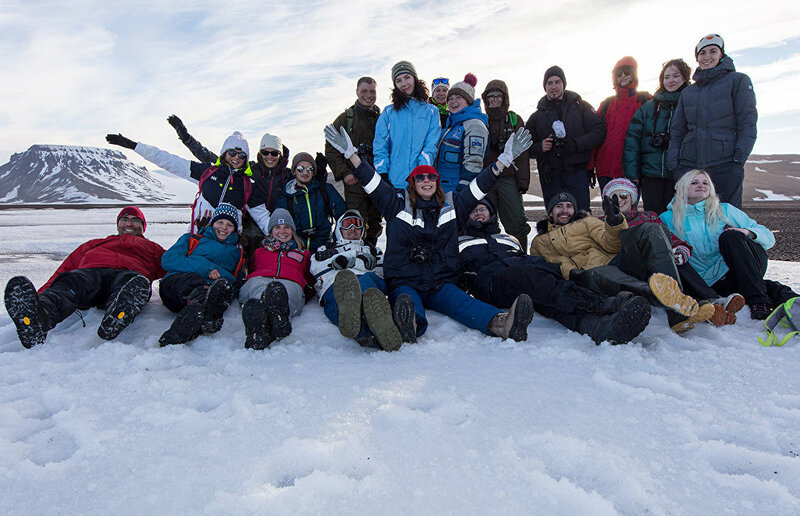 During the expeditions, they are represented by students and research fellows from two Lausanne universities and one in Geneva. We have cooperated via the floating university since 2017 through the development of scientific and education programs. We also have permanent partners from the Scandinavian countries, with which we hold annual expeditions. In addition, we recently started cooperating with China. Is it possible that research fellows can be permanently employed after successful participation in the program? If you mean the future of those students who work at the floating university, it is quite bright. There are at least five PhD candidates, including two who have already defended their theses. Participants in the floating university work on the councils of large companies providing environmental expertise. Several people work at my center and some have already found other jobs, but all of them are related to the Arctic. There are prerequisites for participation in an expedition, and these must be met. First, good physical condition is necessary. Of course, candidates must be healthy because we are on our own in the Arctic, in difficult hydrometeorological conditions. Second, successful academic activity and research on the Arctic are mandatory. We hold a contest from which we can see if an applicant's profile meets the expedition's requirements. Since 2014, when we achieved international status, we have another demand: to speak English. Before 2016, a film crew took part in the expedition in addition to the young specialists who won the contest. The film crew made five movies and several leaflets following the expeditions, where several key subjects are covered, such as psychological research, the flora and fauna of the islands, and the everyday life of the participants. Are there grants to take part in an expedition? Yes, we offer grants through the contest that are funded by the university and a grant from the Russian Geographical Society that we have received for several years to support our project. Other participants who lost the competition for tuition free enrollment can of course turn to other sources and look for sponsorship from other funds, for example. Why were the expeditions held after 2012 shorter? We realized that adult researchers and young people are different. The trip needs to be more comfortable for youth due to their psychological makeup. Students are not adult scientists, but bachelor candidates in their third or fourth year or in a master's program. Not all of them are working on marine related subjects, because we have also to carry out research on the ground. Also, there are certain limitations that keep us from carrying out the entire agenda during a single voyage. This is related to various regulations and permits to cross borders, which requires splitting up the expedition in some ways. This is done to focus on certain locations where, for example, different border control requirements may be in force. How is your project better than traditional university studies? Some regions, like the Arctic, are difficult to study through traditional classes, so there are minimal opportunities to study it in Moscow or St. Petersburg. Students can test their theories in practice on a floating university, whether we are talking about a historian, an archeologist, a doctor, a physicist or an oceanologist analyzing warm currents: they can see the object of their studies in real life and gather unique data for their research. Unfortunately, studying the Arctic at traditional universities can only provide a theoretical vision. In this sense, it is very important to understand that on an expedition students can test everything while being supervised by scientists, carry out their research, hone their skills and achieve interesting results. Konstantin talked about the main discoveries made during six years of the expeditions. He focused on the research of how Atlantic water masses change in the northeastern part of the Barents Sea and the northwestern part of the Kara Sea. He believes these observations provide for a fundamental reimagining of the navigation conditions in the region that are related to the ice melting. Konstantin also talked about studying the origins of the Russian Arctic archipelagos and the discovery of living fauna on the Novaya Zemlya Archipelago. These data resulted in excluding these islands from the list of lifeless lands. He also spoke about the first methods for aerial observations and the conservation of cultural landmarks. Were there plans to launch a similar program for school students to introduce them to the Arctic in advance? That's a very good idea for school students, but there are limitations, so we would need to discuss it. Now we are focused on our target student group, so we are not considering expanding our activities. What role does the floating university play in Arctic exploration? I think our role is quite influential. First, in positioning Russia and Russian educational activities in the Arctic region. Second, it develops international ties. At the floating university, scientists and students from neighboring countries can see the Russian Arctic and this ensures that serious scientists and interesting people come from here; that it is possible to work with them and learn the Russian Arctic's legacy. Third, this is about training future scientists. Over 300 students worked on the floating university and many of them continue to work with science. This is not a very large number for Russia in general, but it is significant for the goal of training young specialists. Fourth, there are very interesting and serious scientific results in various areas that have often been praised by the president and the government. I believe our program is very good and successful. It has really come to identify Russian science and education in the Arctic.